Does Hansen Pole Buildings erect the building? No. Hansen Pole Buildings is a supplier of pole building material kit packages only. We have found the average person who can read and understand English can, and will, build a better building for him/herself than most contractors! Hansen Pole Buildings is clearly not a contractor in any sense of the word. We do not construct or build buildings (or portions of buildings) anywhere for anyone. Should you need a builder, we DO have a list of builders for nearly anywhere in the country. Please call our office to receive a builder referral. This is not an endorsement on Hansen Pole Building’s part of the particular builder’s skills or lack thereof. As none of them work directly for us, we can’t guarantee the quality of their work. We DO have a “one strike and you’re out” rule. Simply, if we receive even one verifiable and legitimate negative complaint about any particular builder, we will no longer give out their name to our clients. While this is not a fail-safe method, it does afford some degree of protection. It is always a good idea to speak with other customers the builder has done work for in the past, to get an idea of the builder’s professionalism. If you do feel the need to turn over the construction of your building to a professional (rather than build it yourself), we recommend asking in your local area for someone who does quality work. 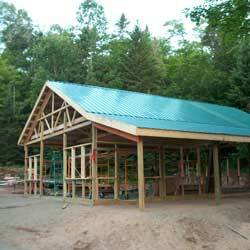 How long does it take to construct a pole barn? This is a factor of building size, complexity and the skill of those working on it. We give a general estimate of person hours with every written quotation. This is based upon totally unskilled workers.